A bathroom exhaust fan is an extraction system that removes moisture and steam from the air. Too much humidity in a bathroom can cause a whole host of problems such as mold, so the quicker you can remove it, the better it is for your home. If you are replacing a fan that’s already in place, or you are cutting a fresh hole in your ceiling, then it’s time to find the perfect model for your needs. A bathroom exhaust fan needs to extract moisture well, operate quietly, and have a seamless installation process. Check out these options below. 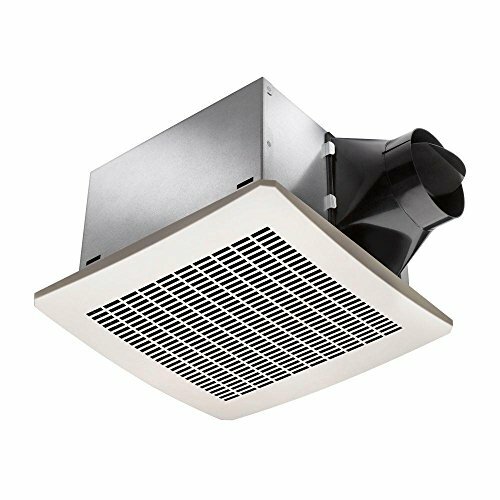 Trying to keep your bathroom dry is not an easy task, but with this bathroom exhaust fan from Monarchy, it’s easier now than ever before. If your bathroom is around 90-120 square feet or less, then prepare to enjoy a comfortable space with minimal moisture and steam. 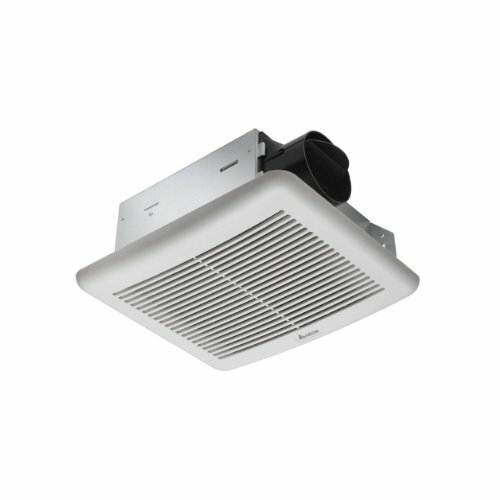 This bathroom exhaust fan offers customers a whole lot of features packed into one small fan. It has an LED light, double hanger bar for installation convenience, and a slim cover too. The cover is perfect for those who prefer to hide their exhaust systems away with minimal disturbance to their décor. It also has a 120 CFM airflow capacity, runs on 120 volts, and has premium stainless-steel duct collars too. What people may also appreciate is how effortless installation is. It takes minimal effort and will let you be able to enjoy what this fan can do quicker. It’s even quiet to operate, efficient, and affordable to buy. There are several reasons why this bathroom exhaust fan may make it onto your ‘must-have’ list. 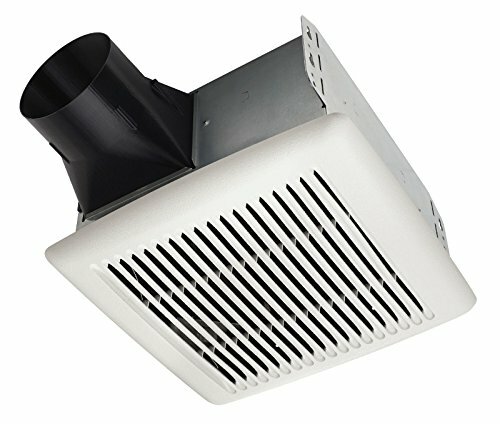 If you don’t mind doing a lot of guessing during the installation phase, then this bathroom exhaust fan from BV could be the very thing you need to lower humidity levels in your bathroom. There’s no denying this fan is going to disappoint when it comes to ease of installation, but it’s a small price to pay for what will ultimately provide a lot of effective ventilation in the years to come. The cut-out is not large enough for the unit, the instructions are terrible, and you will spend a long time in frustration trying to set this fan firmly in place. Once it’s in, however, it’s full steam ahead. You can choose from airflow capacity of 90, 110, or 150 CFM, and enjoy the one-year warranty that comes with it. 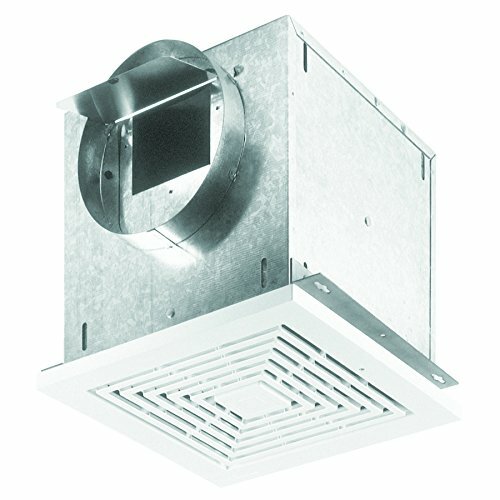 This bathroom exhaust fan also requires a 10.5 x 10.5 opening, sits eight inches high, and comes with a four-inch stainless-steel duct collar. That’s not all the benefits of this fan either. It will vent an area up to 150 square feet, sits unobtrusively in your ceiling, and is energy efficient too. What’s more, when you’re running it, it operates quietly at 0.7 sones, so you’ll barely know it’s there. Sealing the deal is the inclusion of internal lubrication and a heavy-duty motor which offers peace of mind of its longevity. It might be time to find out more about this BV bathroom exhaust fan today. 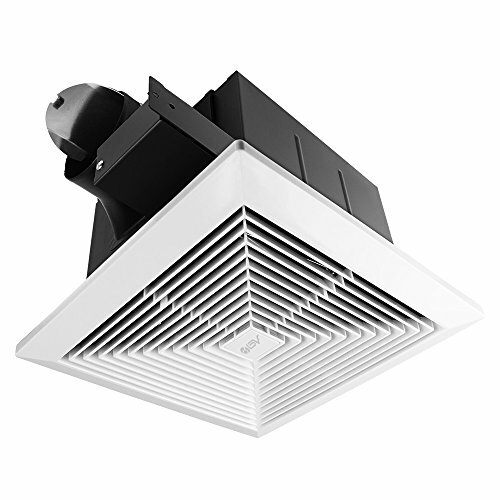 Even though this bathroom exhaust fan from Panasonic might be far louder than the model you are looking to replace, you won’t mind in the slightest. Everything else about this bathroom exhaust fan is bound to impress the harshest of critics. Firstly, you can choose from three models, already starting you out on the right foot. You can get a fan on its own, a fan with a light, and a fan with a motion sensor. Once you pick the one you want, it’s smooth sailing from here on in. The Flex-Z Fast installation process offers convenience from start to finish, and you even get a detachable installation adaptor that comes with it. The housing depth is impressive too, at 5-5/8-inch. 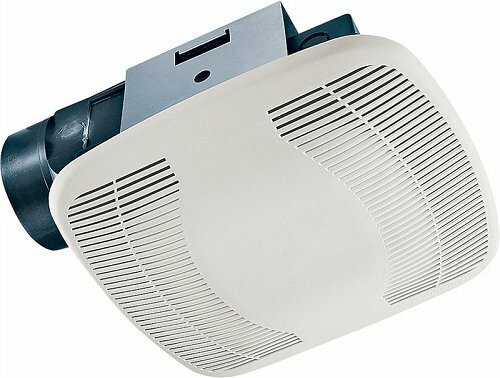 When it comes to getting rid of moisture from your bathroom, this bathroom exhaust fan is in a league of its own. Thanks to its Pick-A-Flow speed selector, you can remove it as quickly or as slowly as you like, with 80 or 110 CFM air capacity. The flush mount grille, even though it can blow dust from time to time, is easy-care and ties in seamlessly with your ceiling. Sealing the deal is the inclusion of the three-year parts warranty. If something breaks down before it should, Panasonic will cover it free of charge. There are several reasons to consider this bathroom exhaust fan for your next replacement residentially or commercially. When the time comes to upgrade or replace your bathroom exhaust fan, but you’re trying to spend as little as possible, you may come across this model from Broan. Given its competitive price, it’s not going to be perfect, but it could tick all the boxes for affordability and ease of installation if that’s important to you. It’s one of the most affordable fans on the market, is effortless to install, and has a sleek and stylish design to work well in contemporary or classic abodes. It also uses premium materials partnered with a long-lasting motor so you can be sure of its reliability. That’s not all this bathroom exhaust fan has to offer either. The key-holed mounting brackets ensure it’s a quick job for installation, even if you have to cut a bigger hole to replace your old fan. The lens for the lightbulb you need to buy is shatter-resistant, and the 26-gauge galvanized steel is reliable and robust to offer peace of mind. The only real downsides are its noise and air capacity. It only releases 50 to 70 CFM for a small bathroom and is far noisier than many other new bathroom exhaust fans for sale. Otherwise, get out your wallet, for this fan is going to impress. If you are replacing a highly powerful bathroom exhaust fan with this model from Delta, then you may find you’re disappointed. However, if you have a small bathroom that requires minimal ventilation, then this unit will surely put a smile on your face. It doesn’t cost a lot of money, offers four air capacity options to suit your needs, and you can buy one of two models too. 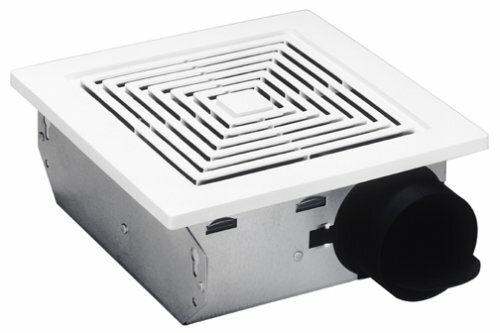 Buy this bathroom exhaust fan as a fan or as a fan with a humidity sensor. Either option is going to offer a range of convenient features to make your bathroom a more comfortable space. It operates with 1.0 sones of noise, has an indicator light to let you know it’s working correctly, and the DC brushless motor will keep going and going – offering much-needed peace of mind. Even the construction of the fan will impress. It features galvanized steel to last the distance. It’s robust, well-made, runs quietly, and won’t put a lot of pain on your electricity bill either. If there’s anything to complain about, other than its strength compared to other models, it’s the instructions. If you’re not a handy person by any stretch of the imagination, then you may find that calling in the experts for installation is a must. There are some durability and installation issues with this bathroom exhaust fan from Broan. While they may not put you off purchasing the fan, they can end up being a sore point every time you walk into the bathroom. Firstly, this bathroom exhaust fan is not straightforward to install. The inferior quality of many parts can see you have to “tip-toe” around installing it, making sure you don’t break anything. For example, the duct fan closure is plastic, whereas most other fan models feature steel. It’s not a deal breaker, but it’s a source of frustration. If you get to choose from this Broan bath fan with or without a light, go for the one with the light. For some reason, even though both operate with 0.3 sones of noise, the model with the light is quieter. Both, however, feature white grilles, 120 volts, and an airflow capacity of 80CFM. The 12-pound weight of this bathroom exhaust fan can make installation hard work, but with the help of the hanger bars and six-inch ducting, you will get there eventually. Broan also rates this bathroom exhaust fan as universal for installation, so if you’re replacing an old fan, this one will fit into place nicely. It’s not the best fan on the market, but it’s also not the worst. Therefore, if price means a lot to you, you’d put this fan near the top of your list. There are a few teething issues with this bathroom exhaust fan from Kaze Appliance, but given how advanced this model is compared to others, you possibly won’t mind in the slightest. If the time has come to upgrade your current bathroom ventilation system, then there are a million and one reasons why this fan should be the one of choice. The first standout feature is the lighting. Unlike other models on the market, Kaze Appliance makes a point of ensuring the lighting is top-notch. You not only get a standard LED light but a nightlight too. Both run on minimum wattage and keep your power bill manageable at all times. However, when you replace the bulbs, you will notice how dim the supplied one was! When it comes to airflow, there’s nothing to complain about with this fan. It offers 110 CFM of airflow and takes care of moisture well. From time to time though, condensation can drip from the vents. It’s also quite noisy, operating with 0.9 sones. If you’re sensitive to noise, select a bathroom exhaust fan that’s around 0.5 sones or less. Installation is easier than you will probably think it is. It comes with double hanger mounting bars, four and six-inch duct adaptors, and the option to hard wire the lights to your switches. If you find that anything goes wrong with parts or the fan unit itself, enjoy your included three-year warranty. This bathroom exhaust fan will impress. The most common bathroom exhaust fan on the market is square, but what if that doesn’t suit the look you are going for in your bathroom? Then it might be time to buck the trend and go for a circle. Hunter Home Comfort is proud to offer consumers something different – a round bathroom exhaust fan that works like any other but stands out in a league of its own. It comes with lights, operates two bulbs at the same time, and sits pretty in your ceiling with a white satin finish and frosted glass enclosure. Who knew a bathroom exhaust fan could look so elegant? 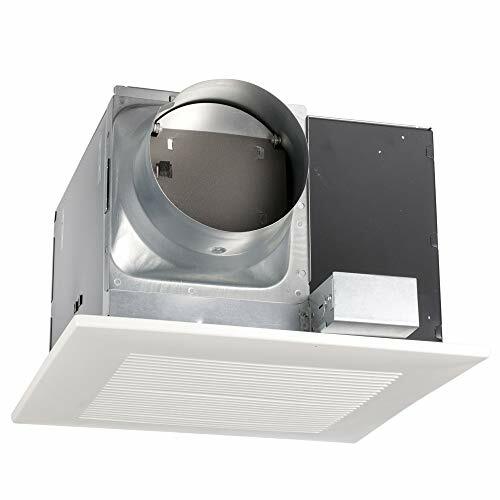 What you will also like is that this bathroom exhaust fan comes with all the mounting hardware, clear instructions, and a competitive price tag. It’s light and bright, lets you hard wire the lights together or separate, and suits most bathrooms beautifully. It’s not as quiet as others and can be challenging to install if the shape confuses you, but this bathroom exhaust fan is an excellent example of a useful product that can be convenient as well as decorative. This bathroom exhaust fan might not be the best option for those of you who have tall ceilings in your bathroom, but if you have a standard bathroom and everyday needs, then there’s every reason to consider purchasing this fan from Aero Pure today. What will first stand out is the variety on offer. Most fans on the market are white, even if that doesn’t suit your bathroom. Sure, you could probably paint them, but it would be better if you had more color options from the get-go. Aero Pure offers them. While you can still get a white grille, you may also like to choose satin nickel or oil-rubbed bronze. What’s more, you get to choose from two housing size options. Having a choice is convenient if you already have a fan in place you want to remove. It’s also unique in its styling, is not at all challenging to install, and operates efficiently too. For a standard bathroom, it’s going to tick all the boxes. 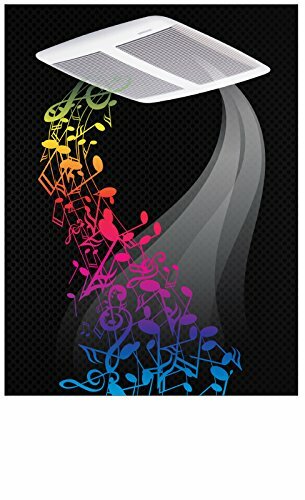 It’s a bit noisier than other models for sale due to its 0.9 sones rating, but its slim fit and styling can see you adding it to your shopping cart anyway. It’s a premium fan that will get a lot of attention. It’s easy to think that any bathroom exhaust fan is going to be suitable for your bathroom. After all, don’t they all look and operate the same? Unfortunately, they don’t. The best fan is one that’s quiet, ventilates well, and doesn’t take much work to install. Below, we run through a few considerations to make before you add an option to your virtual shopping cart. The first thing to consider will be airflow. The more airflow you have, the better your fan can do its job. To measure how much airflow you need, you have to factor in the size of the bathroom in which it’s going. If you have a large bathroom, you will need a fan with a higher CFM. One of the biggest banes of the average consumer is choosing what they believe to be the perfect fan, then finding out it’s a complete nightmare to install. There are two ways to get around this. If you are installing the fan yourself, read the comments regarding the ease of process. It may also help to measure the hole your old bathroom exhaust fan left behind and ensure the new one will fit. Alternatively, you can pick a fan that meets your needs, then hire an expert to install it. Most manufacturers prefer you to do this option for safety reasons. Sones is the sound rating of your fan. While it’s not the end of the world if your fan is noisy, it’s much-appreciated if it’s whisper-quiet. Most of them aren’t, but there are a few that are better than others. Read through the description to find the sones rating. The best bathroom exhaust fan is one with a sones reading of under 0.5.